What's happenin'? Newly released in widescreen-format Blu Ray from Olive Films, the 1975 coming-of-age drama Cooley High vibrantly redid the basic formula behind American Graffiti with an all-black cast. Nostalgia aside, this movie is about as cheesy and cynical a cash-in as one would expect from the cinematic sausage factory that was American International Pictures. Still, it boasts some nice acting, filmed with gritty immediacy in the urban canyons of Chicago, and enjoyably scored with a Motown-oldies soundtrack long before it became a cliché. Cooley High ends up being too sprawling and messily done to favorably compare with American Graffiti. It does pretty well, however, in focusing on the two main characters - best friends intent on goofing off, playing hooky and getting some tail before they graduate Edwin G. Cooley Vocational High in the year 1964. While the smooth-talking and charismatic Richard "Cochise" Morris (Lawrence Hilton-Jacobs of Welcome Back, Kotter) is the strutting alpha-male of his clique, pal Leroy "Preach" Jackson (Glynn Turman) takes on a more subdued but no less slick role, using his bookish ambition to be a writer to impress the ladies. With their nerdy little pal, Pooter (Corin Rogers), and a few other hoodlum classmates, the group spends their days rough-housing and their nights looking for the nearest necking party. Cochise's playing around extends to attempting to fool some local prostitutes into giving him cash, although Preach makes some headway in the romance department with his lovely yet standoffish classmate, Brenda (Cynthia Davis). Their law-skirting freewheeling gets serious, however, after a couple of bad eggs persuade Preach and Cochise to take a joyride throughout Chicago in a stolen vehicle. The two manage to avoid jail time thanks to a sympathetic teacher, Mr. Mason (pre-Saturday Night Live Garrett Morris), but the incident leaves them on the run - pursued by the pissed-off hoodlums who ended up serving time for Grand Theft Auto. Despite the carefree times to be had by these guys, Cooley High markedly differs from Graffiti in showing that the prospects for Cochise, Preach and the rest are dim at best. Most come from broken homes, faced with a future of dreary factory work - so it's natural that they've got a "why not have fun when you still can?" attitude. Spontaneously filmed around Chicago in a span of two weeks, director Steve Krantz haphazardly stages Cooley High as a series of sloppy misadventures filled with boasting, petty gambling and random fistfights. It almost worked - mostly thanks to the appealing work of Hilton-Jacobs, Turman and Morris - but it seriously needed a lot more tightening-up in the editing stage, along with a script overhaul that de-emphasized the repetitive shenanigans and devoted a whole lot more to character development. Cooley High was a film that I first encountered one weekend in the mid-'80s while it was playing on a local television station. The broadcast must have been at least halfway through the movie, but I nevertheless got sucked in by the funky, urban atmosphere and the music, eventually watching it through the bittersweet ending. In a lowered-expectation setting like that, movies like this can be an unexpected treat. Cooley High's characters and premise ended up getting better-served, however, in What's Happening! !, the 1976-79 TV sitcom it inspired. I'd also recommend director Michael Shultz's follow-up film, 1976's Car Wash, which has a similarly funky, improvisational feel but a much more diverse and better-written cast of characters. Olive's edition of Cooley High restores the film's original 1.85:1 proportions in anamorphic widescreen, a marked improvement over the open matte full-frame presentation used on MGM's DVD from 2001. The grainy film stock and desaturated color is pretty typical of '70s AIP productions, although the high-definition transfer looks clean enough. White specks and dirt are a common occurrence on the weathered print used for this disc. The mono soundtrack is a decent listen with some distortion in louder passages, along with isolated pops and clicks. Subtitles and alternate audio are not provided. 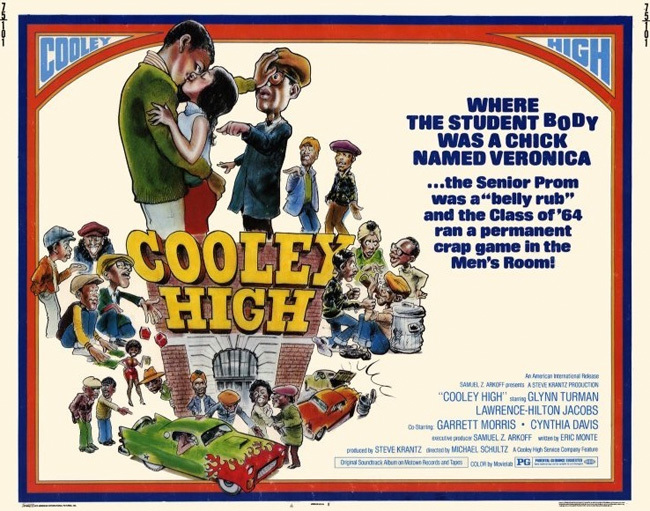 A dream home-video edition of Cooley High would include the 2014 episode of Unsung Hollywood which recounted the film's production with new interviews from the cast and screenwriter, or perhaps the unaired TV pilot for the sitcom version that eventually got retooled as What's Happening!! (if it exists!). This is Olive, however, not Criterion - zero extras. Cooley High has gotten an appreciative following for its gritty yet humorous portrayal of high school buddies in 1964 Chicago. Unless you were around when it came out in 1975, however, I'd slot this one as a "you should've been there" sort of movie. A few nice performances and a decent, improvisational feel for what it's like to be an inner city teenager overcome what's otherwise a shrill, shoddily made American Graffiti clone. Rent It.